Democratic Presidential Candidate and Congresswoman Tulsi Gabbard, D-HI, speaking on The Exchange. Representative Tulsi Gabbard of Hawaii declared her candidacy early this year, one of the first Democrats to do so in what has since become a crowded Primary field, with more candidates likely to jump in. Gabbard is a Major in the Army National Guard and deployed twice to the Middle East. She has called for a "sea change" in U.S. foreign policy and supports Medicare For All. Listen to the conversation and scroll down for a transcript of the discussion. Occupation: Currently representing Hawaii's 2nd District; she was first elected to the U.S. House of Representatives in 2012. Experience: Hawaii Army National Guard, Hawaii House of Representatives (youngest woman elected to the Hawaii State Legislature; she was 21), Vice Chair of the Democratic National Committee (she resigned from her post in 2016 to endorse Senator Bernie Sanders for President). Gabbard served tours in Iraq and Kuwait and still serves as a Major. Priorities: Rep. Gabbard has said she wants to pull U.S. troops out of Syria (though she has expressed concerns about doing so in a "hasty" manner) and has called for an end to "regime-change wars." She has called for Medicare for All, a "sea change" in U.S. foreign policy, and raising the minimum wage. Controversies: Gabbard's 2017 trip to Syria during which she met with Bashar al-Assad on what she referred to as a "fact-finding" trip caused consternation among Democratic leadership and others in Congress, some of whom questioned how she could claim to be anti-war while meeting with Assad, who had been accused of war crimes against Syrians. Gabbard claimed at the time she was working to promote peace in the region. Early in her political career, Gabbard opposed gay marriage and abortion but says she reversed those positions after experiencing a change of heart during her tours in the Middle East, where she says she witnessed the effects of government using its power to "both define and then enforce 'morality'." This transcript is computer-generated, and may contain errors. You'll get a better experience of the on-air conversation by listening to the audio posted above. [00:01:00] Today it's a special edition of The Weekly New Hampshire News Roundup. The first in our primary 2020 interviews with the presidential candidates. Joining us in the studio is Congresswoman Tulsi Gabbard from Hawaii 2nd Congressional District. She was first elected to Congress in 2012 during the 2016 presidential election. Congresswoman Gabbard was a major supporter of Senator Bernie Sanders. This time around she's running against him and many others in her quest for the country's highest office. Today on The Exchange a conversation with Congresswoman Tulsi Gabbard. What questions do you have for her? E-mail us the address is exchange at NHPR dot org or you can post a comment on Facebook or Twitter or just search for NHPR exchange or give us a call. The number is 1 800 8 9 2 6 4 7 7. And Congresswoman Gabbard thank you very much for being here, welcome to New Hampshire and to The Exchange. [00:01:48] Aloha Peter it's great to be here this morning thanks for having me. [00:01:51] And thanks for bringing the aloha spirit. So to begin with: Can you give us a sense of where you see yourself fitting into the Democratic Party. I know labels are tricky but maybe you have one in mind … liberal progressive conservative…How would you label yourself? [00:02:07] These labels are tricky because so often they are misconstrued or misused or used to really create more divisions between us. The way I approach issues, what I am most focused on, is seeing how can we bring about positive change that best serves the interest of the people and that protects our planet. We've got to be able to look at where are the best ideas coming from in order to bring about those actionable solutions, so that's where I'm focused. [00:02:36] OK. And people may remember your name because of your prominence since being an early supporter of Senator Bernie Sanders four years ago in his quest for the presidency. So I wanted to ask you how do you see yourself differing from him politically? [00:02:51] You know, I'm a soldier currently serving the Army National Guard now for almost 15 years, deployed twice to the Middle East, and in Congress for over six years, have served on both the Armed Services and Foreign Affairs Committees. These experiences are unique in this field of candidates who are running for president, a job that the most important responsibility the president has is to serve as commander in chief. And so the experience, the qualifications, and the credibility that I bring to this job come from those experiences, and it's why I'm running for president. Essentially I'm running for president to bring about an end to our wasteful regime change, war policies, to bring about an end to this nuclear arms race, and take the trillions of dollars that we are spending on these wars and these weapons, that are making us less safe and that are increasing suffering, and people in different countries in the world, take those dollars and bring them back into our pockets to serve the needs of our people and things like health care and education and infrastructure and so much more. [00:04:00] Well, let's talk a little bit about issues of war and peace. Given your experience in the Hawaii Army National Guard you've served overseas. How specifically would you say that that changes your your way of doing business in Congress? [00:04:14] Yeah, you know one of the things that I appreciated so much throughout my time serving in the military, throughout both of my deployments, is how we were serving alongside people from all different parts of the country, different races, ethnicities, religions, sexual orientations, people who rarely represent the diverse fabric that makes up our country. We served with a single-minded focus on our mission of service to our country. That to me represents the direction and the kind of leadership that I bring, of putting the well-being of our people first, putting the interests of our country first. [00:04:54] So on the matter of foreign policy you've called for a sea change in foreign policy and you've suggested that you're the most qualified candidate to carry out that sea change. Before we get into what that change is, tell us why you're most qualified. [00:05:07] It is because of the experiences that I have that I bring that depth of understanding and knowing firsthand the cost of war, the experiences overseas, specifically serving in the armed forces. You know I, during my first deployment to Iraq 2005, really during the height of that war, where we were experiencing a lot of high casualties and I served in a medical unit. During that deployment we were based in a camp about 40 miles north of Baghdad and the very first thing that I did every single day that I was there was go through a list of names of every single American casualty that had occurred the day before, and I had to go through that list of names to see if there were any of the soldiers from our brigade combat team of almost 3000 soldiers to make sure that if they were hurt they were getting the care that they needed or to get them evacuated as quickly as possible. It was a heart wrenching. It was a heart wrenching experience knowing that these are my brothers and sisters who are paying the price for this war, for a decision that politicians made that was counterproductive to our country's interests. That was counterproductive to the interest of the people in that country and represented yet another example of these wasteful regime change wars. This experience educated and informed me and I came back from both of my deployments motivated to wanting to be in a position to do something about it to do something to end these policies and these regime change wars. [00:06:48] So the sea change that you've been referring to is that simply referring to the end to regime change type wars that the United States engages in. [00:06:58] It's again it's focusing on putting the interests of the people first in this country, putting the interests of our country first and ending these wasteful regime change wars is a huge part of it. But it's also looking at how are we building relationships with other countries in the world. You know for too long I think across both administrations we have seen this this fossilised mentality of a zero sum game that you're either with us or against us, that in order for the United States and for the American people to win, other people in other countries must lose. As a result of this we're seeing, for example, how we're in a position today where we're at a greater risk of nuclear catastrophe than ever before given the increasing tensions between the United States and other nuclear armed countries like Russia and China. They're always going to be disagreements or issues that we need to resolve with other countries. But we have to be willing to have those open lines of communication and be willing to cooperate on the areas of common interest and shared interests that makes our country stronger and that makes frankly the world better and gives us a greater opportunity for peace. [00:08:14] So under what conditions would it be acceptable in your mind, or necessary in your mind if not acceptable, for the United States to say you know what, this particular country, there are atrocities that we just as Americans cannot stand for. We have to intervene. Is there a circumstance under which that's necessary and if so what are the circumstances? [00:08:29] You know looking throughout history we see so many different examples of U.S. led regime change and intervention. There are bad people in the world; there are brutal dictators in the world. The United States has proven time and time again that we cannot and should not try to act as the world's police when we do so we end up increasing the suffering of the people in those countries. We end up making our country less safe. As I mentioned our service members and veterans end up paying a huge price along with their families, and the trillions of dollars that come out of the pockets of hard-working Americans every single day to pay for these wars make it so we don't have the resources that we need to best serve their needs just in the recent past. We see examples like Iraq Libya and Syria and in each of these examples we see the counterproductive consequences and the negative consequences of these wars taking place. [00:09:39] With respect to Syria you've been criticized for your position on Syria in 2017. You met with Syrian President Bashar al-Assad. For New Hampshire primary voters who maybe have not heard from you on this yet. Why did you meet with him? [00:09:50] In the pursuit of peace, with an understanding that unless we are willing to have those conversations, unless we are willing to pursue that diplomatic path, meeting and talking, with whether it is adversaries or potential adversaries, the only alternative to that is more war. So I went there to Syria to hear firsthand from the Syrian people about what was happening there and about how the United States policies were impacting them. So not only did I meet with Assad, I also met with religious leaders who were very concerned about the continued rise of terrorist groups like ISIS and al Qaeda, and their expression was: if you if you topple Assad, if you topple this regime, the most powerful force on the ground were terrorist groups like ISIS and al Qaeda. They will be the ones to step in and there is a certainty that they will completely massacre all religious minorities there in Syria. I met with some of the leaders who led the political protests in Daraa in 2011. People who were very strongly opposed to the Assad government and would like to see a change. Their message was - we want to be the ones, the Syrian people need to be the ones, to bring about this change, to bring about reforms, to their constitution, to open up their elections. They were against the United States intervention by Saudi Arabia, France, and Qatar, and other countries, speaking out strongly that they want to bring about this change in and not violently but peacefully. [00:11:38] Assad's government has been accused by the UN of committing war crimes, torture, nerve gas attacks. Is this the kind of leader not just for Syria but in other countries that the United States should be directly engaging with in this way? [00:11:53] Well two things. First of all we have to look at the unfortunate reality that exists, and this is the pragmatic reality, that if the United States goes in and starts to topple dictators that they don't like, like Assad, we have to understand who will take over, what force will take over, and how that will worsen the situation, increase the suffering, increase refugees in Syria. I think we have to look at the reality of what's happening on the ground there, where there may be actors and countries that we don't particularly like or who we disagree with. But if there are terrorist groups for example like ISIS and al Qaeda there, there is a shared interest that we have, in defeating those terrorist groups and we should work with whom we need to do to accomplish that. [00:12:43] Jackie wrote in to ask: how do you feel about our use of economic sanctions? [00:12:49] You know this is such an important question because too often these sanctions ultimately result not in, basically, they ultimately result in increasing suffering for people in these countries. So often these sanctions are implemented to either accomplish a political objective or to basically be used as a punishing tool against someone that the United States deems to be a bad actor. But Syria is a good example where there are sanctions by the United States and by the U.N. and other countries in the world, that are not accomplishing maybe the kind of change they were intended to carry out but instead are completely inhibiting this country and the Syrian people from beginning to rebuild their lives. I met when I was there with small business owners in Aleppo and they were talking about how there is that they can't open a bank account to do business with people across the border in Lebanon for example. There are two women who had an amazing story of their small business that they created of sewing and how they were hiring other women. Their business was completely destroyed by the war, they were trying to rebuild. But they said that their only option because of all of these massive sanctions is basically to operate on a cash only black market. So we've got to look at these different sanctions regimes, look at what is their objective because, if a sanction is put in place it needs to have a clear objective that we're trying to accomplish, at which point that sanction would be lifted. Too often that's not the case, it's just saying we're going to punish you because you're bad. And here are some sanctions to do that without really thinking through what are the consequences. And secondly we've got to look at again who is most being impacted. So this is legislation that I'm working on drafting right now because, believe it or not ,there is there is no mechanism in the United States government right now that actually assesses all of the sanctions that the United States has on individuals and other countries around the world to see, hey, is this actually accomplishing what we intended. What are the negative unintended consequences and then being able to adjust and shift course as necessary. [00:15:07] What is your view of executive power versus congressional authority when it comes to war and military conflicts? I feel like we've seen in the past decade and a half that the executive branch has taken a lot more power away from Congress. What do you think of that. [00:15:23] I introduced bipartisan legislation called the no more presidential wars act that gives you some indication of where I'm coming from. The United States Constitution provided Congress with the responsibility of declaring war not the executive branch. Most people don't know that the last time Congress actually did that, the last time Congress declared war, was during World War II. And yet we see how many different conflicts and wars our country has been involved with and waged since then. So this is a big issue that Congress has not reclaimed this constitutionally provided responsibility, and also the executive branch has overstepped its boundaries in waging war and starting conflicts, waging regime change wars, from, frankly without authorization from Congress. Give a couple of examples that are happening right now in that area. One being in Yemen where the United States including the United States military is supporting Saudi Arabia in a genocidal war in Yemen that has created the worst monetary and crisis of our generation. Killing tens of thousands of Yemeni civilians, causing millions more to starve and fall sick because they can't get clean water, access to medicine because of blockades that are put in place. This is all happening with the United States support, military support, with no authorization from Congress. We voted in the House of Representatives recently to bring about an end for U.S. support for this genocidal war in Yemen. The Senate recently passed legislation as well. This is how Congress should be asserting its authority to say no this is not something that Congress has authorized or approved and it must end immediately. [00:17:15] I want to switch our focus for a moment to elections because U.S. intelligence agencies told a Senate Intelligence Committee in January that Russia and China still seek to try to influence the presidential election in 2020, in some ways efforts at least on social media have already begun. So what do you think needs to happen when it comes to protecting the integrity of the U.S. elections against foreign interference? [00:17:36] This is such an important thing that speaks to our very democracy itself because if we as voters don't have trust and faith in the integrity of our votes being cast then it brings into question outcomes of our elections and our elections themselves. So there are important issues that we've got to look at as far as influence, and who is or what foreign actors or agents are trying to influence our elections. But I think there's an underlying issue, that is extremely urgent that Congress still has failed to address, which is the integrity of our election systems themselves. I introduced legislation called the Securing America's elections act to address this, because still we see far too many states who use electronic voting systems that have no paper backup. Paper backups important to you? It's huge. There is a hacking conference that takes place every year and I think it was last year that there was maybe 14 or 15 year old girl from Florida who was participating in that. She hacked into a replica of Florida's election system in less than 15 minutes, potentially changing votes cast, and who they were cast for, and who would win that election. States like Virginia took quick action once they were made aware of the vulnerability in their own election systems. And within just a few months they implemented a paper ballot or voter verified paper backup system back in their 2017 election, and they saw I think, I think the elections officer told Congress that it was the first time they did not have a single complaint about the integrity of their elections. So my bill would do just that, it would protect us from any kind of foreign state or rogue actor from hacking into our system and changing our votes, by making it mandatory that you either have paper ballots or if you're using an electronic system you have a voter verified paper backup. This is something that is essential that we implement immediately to make sure that our 2020 elections can be carried out without voters questioning who may be manipulating the outcome. [00:19:55] What you are describing sounds like a great defense, right, we know these attacks are coming up we’re defending against them. What about going on the offense and saying to these countries that we know are doing things, Hey don't do this or else. Like for example do you back sanctions against Russia, for interfering in the elections or do you have another idea for a warning for Russia. [00:20:14] Yeah I think we've got to we've got to be clear eyed about what other countries like Russia and China and others may be doing, Saudi Arabia included, in trying to influence our elections. I think we've also got to acknowledge both for ourselves and these other countries what the United States does to influence and interfere in other countries elections. So this is a two way street that we've got to have real conversations with these other countries about to try to stop their interference in our elections. We've also got to make sure that we are also not interfering in other countries elections. [00:20:50] So just to put a fine point on it. Do you support or oppose sanctions on Russia for what they do with American elections? [00:20:57] The sanctions have to have a clear objective. And we also have to be honest about what we are doing so that we can be a fair and fair negotiator in fixing the problems that exist. [00:21:08] Do you have a strong preference on what those sanctions specifically should be? [00:21:12] What the clear objective should be, they should serve our interests and make sure that the American people know exactly what's going on and that those bad actors are those who are seeking to interfere in our business are not able to do so. [00:21:32] We're speaking today with Democratic Congresswoman Tulsi Gabbard who is running for president. We're going to take a quick break but when we come back we're going to talk about the economy and immigration. Among other things in your questions are welcome. What would you like to ask Congresswoman Tulsi Gabbard as she runs for President of the United States. Give us a call now. The number is 1 800 8 9 2 6 4 7 7. Email exchange at NHPR dot org or post a comment on our Facebook page where you can watch a live video of this radio broadcast. Just search for NHPR Exchange on Facebook. That's all one word and you can find the video there. This is The Exchange on NHPR I'm Peter Biello. We'll be right back. This is The Exchange on NHPR. Peter Biello here in the studio with Tulsi Gabbard Democratic congresswoman from Hawaii and presidential candidate. Give us a call if you have questions for her. The number is 1 800 8 9 2 6 4 7 7. And this part of the program we're going to be talking about the economy, minimum wage, immigration, guns, terrorism, the Department of Veterans Affairs, questions about those in particular are welcome in this part of the program. Again the number 1 800 8 9 2 6 4 7 7. And we'll start with the economy under two years of Republican leadership. The economy is looking good. By many measures very low unemployment. Wages are rising what can your party say that it would do better? [00:23:47] Given how things are going right now I think we always have to try to see how we can do better. I think there are still far too many people in this country who are not earning a living wage who maybe working one or two jobs working more than full time and still unable to make ends meet. We've got to look at how our economic policy and our trade policy is or is not working to serve the American people. [00:24:13] How would you specifically say it is not working right now? [00:24:16] Well let's talk a little bit about trade policy and talk about tax policy. We see how our tax policy continues to frankly benefit either large corporations or those who are the most wealthy among us. We're seeing how the tax bill that was recently passed has increased our deficit and really hasn't helped the folks who needed help the most. [00:24:40] And there's a lot of news coverage around Amazon for example last year I think they made over 11 billion dollars in profit and not only did they pay no taxes, but they actually got over 100 million dollars in tax credits, dollars that are coming out of the pockets of hardworking Americans. These are the kinds of tax policies that need, that frankly, that need to change. Our trade policy. Right now we're dealing with a lot of uncertainty from this administration. But we also see how all the way back, from NAFTA to the proposed trade deal that the Obama administration was putting forward, the Trans-Pacific Partnership, how these policies ultimately would end up benefiting large corporations and multinational corporations, while not serving the interests of the American worker, not providing adequate protections to our environment. [00:25:40] And I think most dangerously giving up our sovereignty on these trade deals, take away power from our government, our elected government, and our democracy and puts it into the hands of corporations and their corporate interests who then have the ability to make a decision that our country is required to abide by. I think these are all things that need to be addressed as we look at existing trade deals and any new trade deals that are being negotiated, is looking at them from the prism: first and foremost how does this benefit our country? How does it benefit our people? [00:26:15] So what kind of provisions would an ideal tax bill have in your mind? [00:26:21] We've got to look at those who are struggling and who need help the most. We've got to look at closing these tax loopholes that are built in, again to benefit those who are, you know, the top ,very very top of the 1 percent in this country and make it so that they are not able to exploit our tax system. What about raising the rates for the highest earners? Yeah I think that's something that we need to look at. I don't know not yet. This is something that I think we've got to look at carefully and look at how we can make sure that this is accomplishing the objective of a fair tax system, again, that provides help and support to those who need it the most. This is something that we're working on and will we'll be releasing in our campaign as part of my platform. [00:27:08] OK. And do you support raising the federal minimum wage? I'm a cosponsor of the legislation in Congress to raise the minimum wage to 15 dollars. I think it is a long overdue step that needs to take place, given it has been so long since the federal minimum wage has been increased. It's such an important issue that won't solve all of the challenges that folks who are working full time minimum wage jobs are facing. But I think it's a necessary step in the right direction towards that goal of Americans being able to earn a living wage. [00:27:44] And so New Hampshire is working towards, at least the Democratic-led legislature here, working towards raising it to twelve dollars an hour. That's not law yet. New Hampshire currently follows the federal minimum. So it seems like you think the federal should be raised and states can go higher than that if they want to. [00:28:04] Because states for example like mine in Hawaii, a 15 dollar minimum wage is not a living wage. Cost of living in our home state is very high. We have oftentimes two or three generations of families living under one roof because they simply can't afford either to purchase a home or even to pay rent. There are not anywhere near enough affordable housing truly affordable housing units available not only in my home state of Hawaii but increasingly in many other communities across the country. So we have to address a few different things. [00:28:40] One is trying to work towards meeting that goal of people being able to work for a living wage, but also the fact that we have we have such a shortage of affordable housing, and looking at what are the other drivers of high cost of living and how can we try to bring those costs down for people. [00:29:00] Some folks, especially small business owners, will say raising the minimum wage to even 12 dollars an hour or fifteen dollars as you say on the federal level would really hurt small businesses and it can cause folks to lose their jobs. How would you respond to that? [00:29:13] I think we look at the data and statistics from states who have increased their minimum wage at the state level. And we don't see that correlation existing, of small businesses shutting down or large numbers of people being laid off. I think this is about taking a fair approach and recognizing that we all want to invest in making sure that folks, again who are who are working hard and working full time, at a very basic level are able to survive. [00:29:42] What do you think of a guaranteed basic income as at least one other presidential candidate is pushing for? [00:29:50] You know it's something I'm actually taking a serious look at. I think there's opportunity there to look at, for example, many of the different programs that we have in place to provide assistance to people, and seeing how we can perhaps bring down the overhead cost of that bureaucracy, and provide a basic income for folks dealing with, again, dealing with bringing down that overhead coss and also looking at how we can help lift people out of poverty and provide some level of certainty. You know it wouldn't be enough to completely replace someone's income by any means but to be able to have that basic level of economic security I think is something that we should work towards. So I'm looking at it and seeing exactly how something like that could be done. [00:30:38] I want to get to some listener questions - if you have questions give us a call 1 800 8 9 2 6 4 7 7 or send an email addresses Exchange at NHPR dot org. State Rep. Dave Morrill wrote in, he says he's a cosponsor of a bill to bring ranked choice voting to New Hampshire. The intention is to implement ranked choice voting in New Hampshire for the upcoming primary. So Congressman Gabbard, what are your thoughts on ranked choice? [00:31:02] You know it's something I'm looking at. It's something that I've heard from a lot of folks, it's gaining a lot more interest and support in different states and in different local elections, to try to make it so that those elections more accurately represent the wishes and the voters of the people so, I'll be interested to see what people here in New Hampshire feel about it. [00:31:25] Let's talk a little bit about immigration. What do you think the role of immigrants should be in filling, we’ll say workforce shortages. Should we give greater flexibility for workers who are in the country without documents to fill some open positions? [00:31:41] I think we've got to look at this from the perspective of how our immigration system is not working for us. It's not working for our economy. It's not working for the American people right now, and it's not working for those who are seeking asylum in our country, and those who have been here for a very long time, who may be undocumented but have been paying into our tax system and are trying to find a legal way to stay here. [00:32:08] So we've got to pass comprehensive immigration reform to address a whole host of these issues. [00:32:14] For example like l dreamers, people who were brought here when they were kids through no choice of their own and who've known no other home than the United States, but who today are faced with uncertainty and the threat of being deported to another country, that they don't, that they don't know. We've got to address the needs at our border. Border security is a reality that we have to face that as a country our borders need to be secure otherwise we don't really have a country. [00:32:47] And so how would you go about securing them? By looking at what are, what's the best technology, what are the best ways that we can make sure that those, that our borders are secure. Does that include a wall? There are at least certain places along our border that already have some form of a barrier. There are other places along the border where it makes absolutely no sense to have a wall or a barrier of any kind. So rather than getting caught into what has unfortunately become a political mess of a conversation, where it's just wall or no wall, really what the issue is is security, and looking at what's the best technology that we have available to reach that objective. I don't know if this is this is my soldier mindset and training but I think ultimately with each of these issues they get so caught up in partisan politics that we lose sight of what the actual objective is. If we Democrats, Republicans, independents can come together around that shared objective of, for example, making sure that our borders are secure, then we can find the best solution to accomplish that, rather than letting partisan politics get in the way. [00:33:56] What about the path to citizenship? Is there any change in your mind that you think needs to be made to help people who are undocumented to become documented citizens? [00:34:05] I think there has to be some, some way, some opportunity there for those who are here and undocumented to try to pursue and have a path towards having a legal, whether it's a legal residence or ultimately a path to citizenship. [00:34:22] There is a path to citizenship now, it's just sometimes out of reach for certain people, whether it's too costly a process, it's too long to wait, or it's given a middle ground that they're forced to live with that's not quite citizenship and not also deportation. So I guess what I'm asking is, for the current system that allows a pathway to citizenship, what changes if any should be made to it? [00:34:44] Well I think that we have to address some of the things that you just talked about, the fact that it is out of reach for people who can't afford an expensive lawyer to guide them through this process. This is something that that we see and deal with, a lot of families in Hawaii for example, who come from all different parts of the world and countries like the Philippines and others who have a hard time just navigating through the process, and the fact that it takes so long. Another example, an area where we need reform, is how we have small business owners, some friends of mine, who basically are unable to invest in and grow their business and hire employees because every single year they are faced with uncertainty about whether or not their visa, as small business owners, will be renewed. Every single year they're faced with the question of whether or not they'll have to go back to their own country. I don't think there's any one specific change that we can point to, to address all of these different issues, but I think these different examples point to the need for this comprehensive reform to deal with the backlog, to deal with the long wait time, and to deal with the fact that the system as it stands is not a very fair or workable system. [00:36:00] Some Democrats have called for the abolition of ICE. Do you agree with that? [00:36:04] I don't. I think abolishing the agency itself doesn't actually deal with the problem that we are seeking to solve. What we are seeing right now unfortunately and it's heartbreaking to hear the stories of people who are being impacted essentially by an agency that acts without any real oversight or accountability. This speaks to a problem with leadership more than it does the agency itself. If you just get rid of the agency, if you just get if you just abolish ICE, there will be some one else, some other entity, whether it be federal or state, that steps in to fill that void of enforcing our immigration laws. We've got to get to the heart of the problem and address that. [00:36:49] We got a comment from Laurie who wrote in about our minimum wage discussion. She writes: as a small business owner in the state I could not possibly afford fifteen dollars an hour. I would have to let my employees go and try to manage my business myself which ultimately could mean my business's demise. Would you not think it fair to put caps on businesses? In other words businesses with fewer than X amount of employees or businesses that bring in less amount of gross income per year. Your thoughts on Laurie's comment. [00:37:18] I think, I think this is a bigger question of, you know, for Laurie, for example, perhaps it would mean she would have to increase her prices a little bit so that us, as customers can come in and help pay for and provide for the services that her employees are offering. I think this is something that we as a country, whether you're a small business owner or a large business owner, or a consumer of services or products, that we recognize this need to invest in each other and invest in the people in our community who are working. [00:37:50] Listeners give us a call if you have questions for Congresswoman Tulsi Gabbard. The number is 1 800 8 9 2 6 4 7 7. And let's talk to Michael in New Market. Michael thank you very much you're on the air. What's your question. [00:38:02] Hi. Thanks for taking my call. Congresswoman, thanks very much for being here in New Hampshire. Thanks Michael. I'm a blue dog Democrat and I'm having a very difficult time with the entire Democratic field. The one issue that nobody is talking about, on both the right or the left, is the budget, the debt. And I think we're being intellectually dishonest when we're talking about all these spending plans and not talking about how to pay for them or how to pay down the debt or to just balance the budget. And I'd like to know what your thoughts on that are. [00:38:38] OK thank you very much Michael. [00:38:39] Thanks Michael. You know this is such an important question and this is really one of the main reasons why at every town hall or living room conversation that we are in, I bring up the cost of war, because the trillions of dollars that we're spending on these wasteful wars and nuclear arms race, those are trillions of dollars that we need, that we need to either put back in our pockets and to invest in the needs of our people, to invest in things like infrastructure, to invest in education, to invest in health care. Unless we do this, unless we shift our priorities, we are going to continue to be in a situation where our deficit and debt increase and where we will not have the resources that we need to meet those basic needs of our communities and of our people. Your questions are important and it's important for us to recognize again what are our priorities. How are we taking care of taxpayer dollars and being good custodians of your hard earned taxpayer dollars to make sure that they are actually meeting and serving the interests of the people in this country. [00:39:57] This is The Exchange on NHPR. And in this hour we're talking with Democratic Congresswoman Tulsi Gabbard. We're going to take a quick break. When we come back we'll talk a little bit about higher education, gun legislation, Medicare for all, the Department of Veterans Affairs so much to talk about. We want to incorporate your questions to if you'd like to send them along by e-mail. The address is Exchange at NHPR dot org. You can also watch live video of this radio show. You can find the stream at our Facebook page. Just go to Facebook and search for NHPR exchange that's all one word or you can call us the old fashioned way. 1 800 8 9 2 6 4 7 7 9 Peter Biello. We'll be right back. 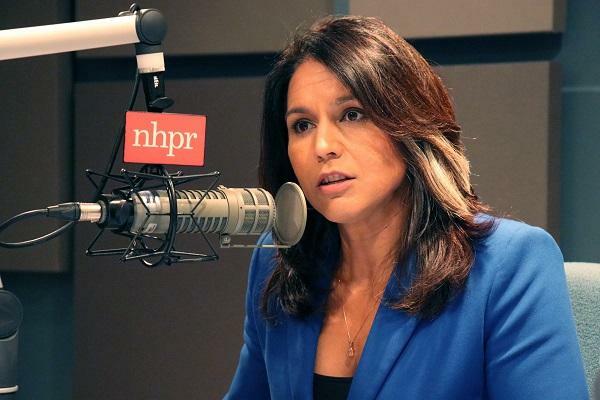 [00:40:58] This is The Exchange on NHPR, I’m Peter Biello in the studio now with Tulsi Gabbard Democratic congresswoman from Hawaii and presidential candidate. Give us a call now if you have questions for her. The number is 1 800 8 9 2 6 4 7 7. So Tulsi Gabbard I wanted to ask you to start the segment about not, just the massacre in New Zealand., there's been a call in that country to make major gun legislation changes. And as a result of that attack American Muslims have felt a little on edge a little uneasy since what happened in New Zealand. So what do you feel political leaders in this country can say now to ease their fears. [00:41:00] We have to stand united in this country against religious bigotry, racism and the kind of hatred and vitriol that leads to tragedies and atrocities like we saw the massacre in Christchurch in New Zealand. Like the massacre that we saw happened not too long ago here at the synagogue in Pittsburgh. Whether it is Muslims or Jews or Hindus or others who are the targets of this violence based in this religious bigotry and hatred we have to stand united in condemning not only these actions, but it is the hateful rhetoric and bigotry and discrimination that ends up leading to these actions. We can't wait for people to lose their lives in their place of worship to then stand up and condemn it. We've got to do it now. Whoever is the target of this bigotry and hatred and wherever it is coming from, we have to stand as one and recognize that an attack against one of us is an attack against all of us. [00:42:56] Do you believe that some kind of federal change to gun legislation would help solve the problem of these mass shootings, like for example should assault weapons like the AR 15 be banned? [00:43:09] I think that there is federal legislation that we need to pass to increase our gun safety laws. We have to uphold the Second Amendment of our Constitution and people's right to bear arms. But we also must make sure that we have sensible safety regulations in place to try to prevent those who have no business owning a gun because they may use it to seek to do harm to others from doing so. The House of Representatives recently passed legislation making universal background checks mandatory. This is a bill that we hope gets through the Senate. [00:43:46] But I think this is an example of an area where you have the vast majority of people across this country who support this kind of sensible regulation taking place. I think there are others, banning bumps stocks for example, banning military style assault weapons. These are things that really are about taking this common sense approach towards increasing gun safety. [00:44:12] So you do believe that banning military style assault rifles is consistent with the Second Amendment? OK. I want to move on to a variety of other things because we've got less than 15 minutes now to talk to you about a variety of issues, among them higher education high cost of education saddling young people with a lot of debt. What would you do if anything to bring down the high cost of higher ed? [00:44:36] A few things. One is, we've got to, we've got to look at how wrong it is that the government or financial institutions are seeking to make a profit off of people who are seeking to further themselves through higher education. You’re referring to student loans? [00:45:00] Yes, student loans and the debt that our students are being saddled with. My father in law is a public high school teacher in Hawaii. I think he just turned 61 years old, if I'm right, I know he just made it over the hump of 60, but he is still today paying off his college student loans. And this is not. This is not a story that's isolated. It's not a unique story. No. This is something that far too many people and families are dealing with for so long throughout their entire lives and careers. And we've got to address why - why are the costs of higher education continuing to rise. And what tools are available to us now to bring down that cost. I think something that is too often not addressed and where there's great opportunity is how do we use technology to both bring down the cost of delivering this higher education and making it far more accessible to people. We also have to look at how we can help provide tools and training necessary to those who are not seeking a four year college degree and want to pursue a more vocational training path to immediately enter the workforce. [00:45:59] But even that can be expensive. It can be. And that's how we've got to look at how we can make it so this higher education, whatever form people take, is accessible for everybody. Would you support or try to pass legislation that would entail free college education both for at the community college level? Yeah I'm a supporter of the bill that we have in Congress called the College for All act that would provide that tuition free education at public institutions for folks whether it be vocational training or to four year degree plan at a public institution. If their families make under a certain amount of money? OK. We're hearing now about a big higher education scandal where very wealthy parents were sort of paying to have their children attend elite institutions. The courts are handling this to some extent but is there anything you think the federal government should do to sort of guard against this kind of thing? [00:46:54] Well as we are seeing this play out, we have laws in place and folks are being arrested and charged with crimes for abusing this system and essentially bribing their way into making sure their kids get into the schools that they want. I mean this is unfortunate and disturbing on so many levels. I think it just shows once again the disparity between the haves and the have nots and that those who are either famous or very wealthy can basically buy their way in while everyone else, every other child or young person, has to compete based on their own merits to get into these institutions. You know I think it's a sad state of affairs across the board. It looks like we've got the laws in place that are intended to protect against this kind of abuse. If there are other opportunities to make sure that this kind of thing doesn't happen again, I think we should look at that. [00:47:53] I want to ask you about the opioid crisis because New Hampshire suffering many deaths as a result of opioid overdoses. What would you do as president to sort of stem the tide of the opioid epidemic?. [00:48:05] There are so many heartbreaking stories that we've heard just from the time that we spent here in New Hampshire alone, and you know these are stories that are unfortunately becoming too common across the country. The last time we were here, we visited Laconia and went to a recovery home and talked with some of the folks there who were walking this path on recovery from opioid addiction. It was it was both heart wrenching and inspiring to hear their stories about how their lives had been completely ruined. One guy was an attorney who was practicing law who was disbarred and who spent time in prison because of this opioid addiction. There was another guy who was a college student who dropped out of school and whose life was ruined because of opioid addiction. Now their stories are inspiring because even given the hardship that they're facing, they were working together and helping each other and trying to help other people down that path to recovery. But there is so much more that we must do and I know we're running short on time but I want to touch on a few important things. Sure. I've introduced the Opioid Accountability Act in Congress that would provide an avenue to hold these opioid prescription drug companies, like Purdue Pharma, accountable for their lies and deception and their practice is basically to get as many of these opioids into our communities and into onto our streets as possible. [00:49:38] A way to enforce a financial penalty perhaps on companies like Purdue Pharma is that what you’re referring to? [00:50:29] And along the lines of the opioid epidemic I want to bring in a question from our listeners, let's talk to Askani, I hope I pronounced your name correctly, from Durham. Thank you very much for calling. [00:50:41 I just want to say thank you again, Congresswoman Gabbard, and I'm a college student so I think it’s really awesome that you’re on the radio, but I wanted to ask, because I've had family that unfortunately has had experience with addiction and trying to overcome. I wonder how you feel about these needle exchange programs, and these safe spaces for people who if they have an addiction to drugs and whatnot. Personally I just feel like it, especially because I have people close to me that are struggling, that it's just not a good idea to help improve, you know, their lives. I was just wondering how you felt about it. [00:51:23] OK. Thank you very much Askani. [00:51:26] Thanks for the call, Askani. I think that these programs, and I've heard a lot about kind of the Hub and Spoke program here in New Hampshire that are being implemented at the local level, do so much towards helping people find that safe space to begin that tough path towards recovery, towards ending that addiction. I want to bring up one thing that I think the state legislature here has passed, I think through the House, and that that is marijuana. I've introduced legislation at the federal level to end the federal marijuana prohibition for a whole host of reasons, but one of which is how we've seen a direct correlation in states that have either passed medical marijuana or completely decriminalized marijuana. We've seen that correlation in a drop in opioid addiction and also a correlating drop in opioid related deaths. So I think there's a number of different avenues that we need to pursue to address this opioid crisis. Not a single one of them alone will be effective in doing so, but we have to treat it like the crisis that it is both in accountability and prosecution for those responsible for proliferating these drugs, and recovery and treatment and help for those who are suffering at the brunt of this crisis. [00:52:53] So just a clear yes or no on the needle exchange, do you think needle exchanges are a good idea? OK. Really quickly want to shift gears and ask you about Green New Deal. We only have a few minutes left, so just really quickly, broadly in favor, broadly opposed, what do you think? [00:53:07] I support the goals and the ideals of making sure that we are making bold investments in a green renewable energy economy and the kind of infrastructure that we need to support that. I think there are a number of different approaches that we need to take to that. What we have seen for far too long is the influence of big oil and fossil fuel companies in Washington, the money that they paid to their high powered lobbyists, that have so far stood in the way of really making the kind of big change that we need to see. This is yet again another reason why I'm advocating for ending these wasteful wars, is so that we can bring those taxpayer dollars and put them towards investing in these kinds of things, and getting us off of our addiction to fossil fuels and making those investments in clean renewable energy that will serve us today and that will protect our planet for generations to come. [00:54:08] Really quickly, supportive generally of nuclear power? [00:54:13] No, I'm not. We've seen, unfortunately, the detrimental impacts, the long term detrimental impacts, of nuclear power the nuclear waste that will stick around forever, that that provides a greater risk for us, but we also see how the potential for nuclear disaster can occur. Obviously we can go back to places like Chernobyl to see how that completely not only destroyed the community there with the nuclear disaster that occurred, but it impacted a much larger area. We see how in Fukushima in Japan, this was a nuclear disaster that happened just recently because of the nuclear power plant there, and how, I was on the City Council at the time in Hawaii and there was a lot of concern about radiation given our close proximity to Japan and how that might impact us. [00:55:09] You know, the fact that nuclear power companies are not able to insure themselves and rely on taxpayers to pay for their insurance and essentially subsidize them, should raise enough of a big red flag, to say this is not the kind of direction that we need to go. [00:55:29] Final question for you Congressman Gabbard, crowded campaign field right now. You've got a long climb ahead of you. How are you planning to make yourself stand out on the debate stage? [00:55:42] I'm a soldier. I know the cost of war. And as president and commander in chief I'm committed to changing our foreign policy and making it so that we are ending these counterproductive wasteful regime change wars, working to end this new Cold War that we are in, and nuclear arms race, and bringing those trillions of dollars back to serve the needs of our people and making sure that we've got health care for all, in making sure that we are providing the kind of support and funding to our education, to our kids and to our teachers, taking care of kids who are needing special education and assistance, investing in rebuilding our crumbling infrastructure. We have so many different, urgent needs that our people have. I'm committed to bringing about that change to meet those needs. [00:56:34] Well, Congresswoman Tulsi Gabbard of Hawaii, and presidential candidate, thank you very much for being with us today. Really appreciate it.